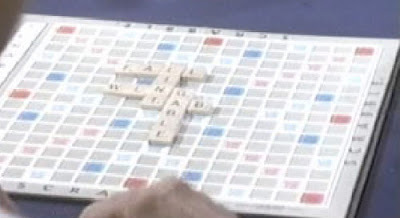 The episode begins with a family playing a game of Scrabble. In addition to the mother and father, who play separately, Pookie, the daughter, is playing in a team with Mookie, her twin brother, who participates by speaking over an intercom from his room upstairs. After playing the word ‘glitch’, which the parents try to challenge, because apparently there was a time when that was only a computer term, Pookie heads upstairs to check on her brother. Oh my god. That’s computer paper that not only has holes running down the side for easy sprocket access, but three pre-punched holes on either side so that the paper can immediately be put in a duo-tang! And it’s supposed to go in a landscape printer! Colour me nostalgic. The twins get into a bit of a fight – Mookie tells Pookie that he’s been working on a special program, but that he’ll likely die before he can complete it. He begs Pookie to finish the program if he dies, and while she’s initially resistant, because she’s jealous of the amount of time he spends with the computer, finally she relents, and agrees to follow the special instructions he’s left her, should the worst happen. Naturally, the worst immediately happens. Pookie barely makes it downstairs to play the winning Scrabble word before an alarm goes off, alerting the family to Mookie’s death. From here we fast-forward to some time after the funeral, where Pookie has decided to deal with her grief by finishing that program. Also, when her mother enters the room, we learn that Pookie’s actual name is Susie. I’m still gonna go with Pookie, though. Mom thinks Pookie should let the program go, and hang out with the friends who have come to visit, but Pookie is already falling into the grip of obsession, and starts working on the program immediately. I find myself wondering just how it is that Mookie had time to write a huge, detailed set of instructions on how to write a mysterious program, but didn’t have the time to actually write that program himself. A time-lapse later, Dad and Mom are having a conversation about Pookie’s new obsession. Apparently she’s spent ‘all summer’ in her room, working on the computer, and he’s grown concerned. He’s made plans to sell the computer to a work associate, hoping that will pull her out of her shell. Then we see Pookie up in her room, working away. And by working, I mean dutifully copying lines of text from the binder into the computer. Seriously, didn’t he have to sit at a computer typing all this stuff in to make the binder? Couldn’t he have just typed it into a program instead of a word processor? Pookie’s mother turns up with a delivery that neither of them expected. Inside is a marvel of modern technology: A voice synthesizer! No, I’m not sure why it looks more like a flatbed scanner than a speaker set, either. Maybe that’s the way voice-synthesizers used to look? Mom is instantly chilled when she discovers where the gift came from. According to Pookie, Mookie is living inside ‘the network’ and ordered it for her (by which he means, stole it for her) because he knew she was ready to hook it up to the computer and give him a voice. This revelation chills Dad to the bone, and redoubles his desire to get rid of the computer, believing that his daughter is quickly going mad. Mom is a little more unsure, and wants to give her more of a chance to prove her point. Sneaking into the room while Pookie sleeps at her desk, Dad starts to unplug the computer, only to be stopped by the printer switching itself on and screaming for help through the voice box. Just for good measure it also types HELP on the printer and as a big ASCII-art HELP show up on the screen. You know, if you’d said that while Dad was in the room, you might have gotten a little better result. Pookie finishes the program, but is frustrated when she doesn’t get an immediate answer from her brother. Then the printer starts up, displaying evidence that Dad has sold the computer! Pookie confronts Dad with that information, and he asks how she knows. Pookie explains that Mookie found the check inside the computer network, and showed it to her. Um… how would Mookie know it was a cheque for the computer? Let’s say Dad deposited the cheque a couple of days ago, and the people at the bank entered all of the accounting and branch information into their computers – Mookie would know a guy paid Dad some money, but how could he possibly know why? Everyone is disgusted by Dad’s actions – Mom’s really switched sides quickly, here. Pookie offers to prove that Mookie is really in the computer, and Dad agrees to give her a chance. Mom sits down and asks the computer a question, typing it into the keyboard. There’s no response. Pookie is confused – Mookie always answers her, so why isn’t he answering now? There’s no response from the computer, and Dad leaves, ready to turn the computer over to his friend from work. The second the parents are out of the room, Mookie starts talking again. So why wasn’t he talking earlier? He explains that Dad still isn’t ready to believe his son is in a computer. At this point I started to wonder if Pookie was just going to turn out to be crazy, but as the second episode proved, that’s not the kind of show this is. Downstairs Mom and Dad have another debate, where Mom winds up ascribing frankly mystical powers to the ‘computer network’, including the possibility that her son’s spirit might be residing there. Proving to be the most reasonable and patient person possibly to ever have appeared in fiction, Dad is convinced by this plea to give Pookie yet another chance. Although he’s not above trying to trick her a little, bringing his daughter a telegram from ‘Mookie’, telling her that it’s okay to disconnect and sell the computer. Pookie is understandably upset by this, and they get into a screaming argument that ends only when the computer speaks up to keep him from unplugging the computer. It seems like he could have done that last scene, but whatever. Yeah, his move was only the fifth one in the game, and the words already down were ABLE, WIN, TAB, LINT, and FALL. If anything, that play should have rocketed him into an incredibly slim lead. Oh, wait, I just remembered this isn’t an episode about Scrabble. We get our shocker ending when it’s revealed that the fourth player in their little game is Mookie, whose computer has been brought down into the living room so he can take part in family game day. That’s the ending. I’m pretty sure it’s not supposed to be creepy at all. In fact, the show even points out that the inclusion of compu-Mookie into the family has brought Pookie back out of her shell, and now she’s going riding with her friends again! I think my confusion about the episode’s ending has to do with the way it’s maddeningly unclear just what Mookie is supposed to be. Are they saying that upon dying his ghost went into the computer, and Pookie had to write a program to allow that ghost to work the computer, or are they saying that Mookie, before dying, wrote a program so complex that it actually simulated his personality perfectly? I’d assume the latter, but the fact that something was flitting around the ‘Network’ ordering voice synthesizers and finding cashed cheques before the program was actually finished clearly implies the former. In any event, the ending of the episode, where Mookie plays an 8-letter word and jumps into the lead while the family laughs along with their adorable computer son is the highest note an episode of this show has ever ended on. Which makes the fact that the show then plays this bookend speech seem weirdly atonal and inappropriate. It’s a fun episode, but I’m really surprised to see them going so far from horror just six installments into the series. I know the show doesn’t have to be horror all the time, but that episode wasn’t even slightly ‘dark’. Also, I really enjoyed how awkward it was to attempt to describe where Mookie had gone without access to the words 'Internet' or 'Cyberspace'.